Baroness Thatcher celebrates her 87th birthday today. She is and will remain my political hero and I wish her many happy returns. 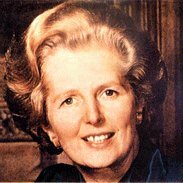 She gave the world “Thatcherism”. She gave it, not just to this country but to most of the world. She took charge of a country whose economy was sclerotic. We were known round the world as suffering “the British disease”. She cured us. She broke the strangle hold of the union barons. She helped thousands of people to buy their council houses so that they could enjoy the benefits and worries of home ownership and have their doors and windows painted the colour of their choice. She demonstrated that the Conservative Party is a broad one, open to all with aspirations. She was a grocer’s daughter who took no shame in applying a housewife’s logic to the national finances. Maggie was not afraid to challenge, to argue, to take on vested interests and to say what people needed to hear whether they wanted to listen or not. She forged an alliance with the United States and retained her scepticism for the federalising instincts of the European Union. She gave to this country in peace time what Churchill gave us in war: leadership, confidence in our destiny, cheerfulness in adversity and victory over an array of enemies within and without. Our affection for Maggie has not dimmed. At the Conservative Party Conference this week, Patrick McLaughlin played a film clip of an earlier conference where he spoke and over which Maggie presided. Sight of Maggie generated an immediate, universal and sustained round of applause. Many of us still miss her. Baroness Margaret Thatcher of Kesteven LG OM PC FRS, this country owes you a huge debt of gratitude for the legacy you have given to us. We can’t repay that but we can wish you a happy birthday and many, many more of them. This entry was posted in Politics and tagged Airey Neave, Belgrano, Falklands, Norman Tebbit, Thatcherism, Willie Whitelaw. Bookmark the permalink.